Obtain the proper contractor licenses before entering any contracts or starting work in a jurisdiction. Make sure you have any local licenses that may be required including building permits and basic business licenses. Have your general liability and workers compensation insurance certificates in order and accessible. Verify that the contractor is licensed. 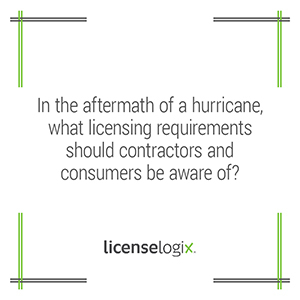 See below for an overview of the specific licensing requirements for contractors in the areas affected by Hurricane Sandy. Look up a contractor and their company online to see if they have a record of complaints or negative reviews. Make sure that the contractor has general liability insurance. The contractor should be able to show you a copy of the certificate of insurance. Establish a payment schedule with the contractor and do not pay the full price of the contract upfront. The New York City Department of Consumer Affairs also warns consumers that they should beware of any contractor claiming to be associated with or licensed by FEMA. FEMA does not endorse, certify or approve any home improvement contractor. Please note that LicenseLogix handles all types of contractor licenses, in addition to home improvement contractor licenses. LicenseLogix can also verify any license. Check with us first before hiring your next contractor. For additional help you can fill in the form on the right or call us at 800.292.0909 any time.